For the past few weeks my students have been working on independent animal research projects. Now I must confess I have never done independent animal research projects with my grade one students before. Typically we study as a class, frogs or butterflies, and we learn together. I guide the lessons and my students learn what I teach them. Yes what we learned varied from year to year, and how we learned the information did too, but I was the teacher. But with the increase access to technology, and my change in teaching practices that way of teaching is no longer good enough for me. Now as I've mentioned my students have had access to technology for most of the year. They have used it to show and share their learning in ways that work best for them. Choice has been key in my class and my students have embraced and ran with it. So I knew my approach to learning about animal basic needs had to change. After seeing Kristen Wideen's grade one and two students create animal research projects I felt it was something I needed to give my students a chance to try too. I modelled the process first with Koala research. 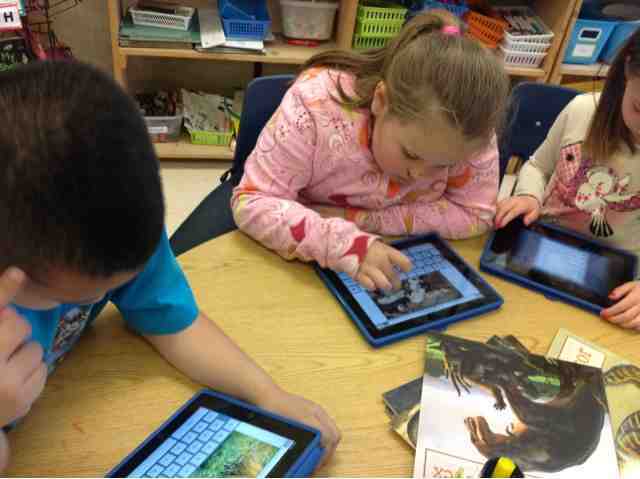 I taught them how to find information through Discovery Ed, the Pocket Zoo app, and books. I encourage them to sort the information they were finding into a graphic organizer created by Mrs. Wideen, but modified for my class. My students were given the task to search for information about their chosen animal under the categories can, are, and have. They were also encouraged to find interesting facts, and ways their basic needs were met. They used Discovery Education to find age appropriate videos (you've got to love the filtering system on Discovery Ed). The Pocket Zoo app also provided more videos for my students, along with web cams to look at. And we had library books too of course. Needless to say my students were excited to do research on animals they were curious to learn more about. My students were told that they could research ANY animal that they were interested in and they could do this on their own or with a friend. It was their choice. Through out this year I have witnessed how powerful it has been to give my students choice in how they learn. I have seen the negotiations and the peer teaching when they work with a partner, and I have seen the independence some enjoy when working on their own. So right from the beginning I never told them that they had to work on their own or with a friend, it was always their choice. Most of them chose a friend. Before I go any further I think it's important to know that I have a typical grade one classroom with a variety of learning styles and unique needs. I have no additional adult support in my room so these projects were created by my students. It was impressive for me to see my students so engaged and on task throughout the work periods. There were tons of questions asked - both related to the animals they were studying, and the steps that needed to be taken. While I answered many of them, they relied on each other for help too. My room was very active with learning during this project. After a few days of fact gathering my students started to put their books together in the iPad app BookCreator. The cool thing about Book Creator is that it has a special feature called "combined books". Knowing this was an option in advance each student created their own pages on their own iPads which would later be shared with their partner to create combined book. This allowed me to see what each student was doing on their own before the final book was combined with their parner's. My students surpassed any expectations that I had for them. I was really impressed with the way they showed their learning. Many used Discovery Ed to find their images while others used Draw and Tell to draw their own. They were all required to have at least one image labeled using the app Skitch, and one graphic organizer created using the app Popplet. 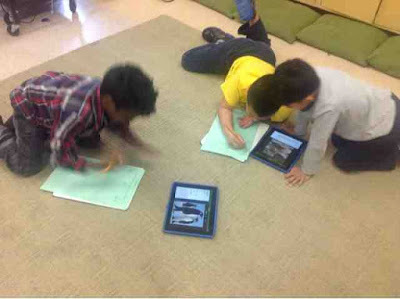 Once the children were finished creating their individual pages the two iPads were brought to me. I saved one part of the two person story into Dropbox and opened it in Book Creator on the other iPad. From there I used the awesome "combine books" feature in Book Creator and combined the two student parts together into one book. My students then moved the pages around, edited for repeat information, and completed their books to their satisfaction. At this point, once they were satisfied with what they had created, they saved their books to iBook. I encourage them to do this because the screen shots are much better when taken from the "published" version of the book. Most groups remembered to do this. When it came time to get the books out of Book Creator to share with the world on their blogs my students chose different ways to do this. 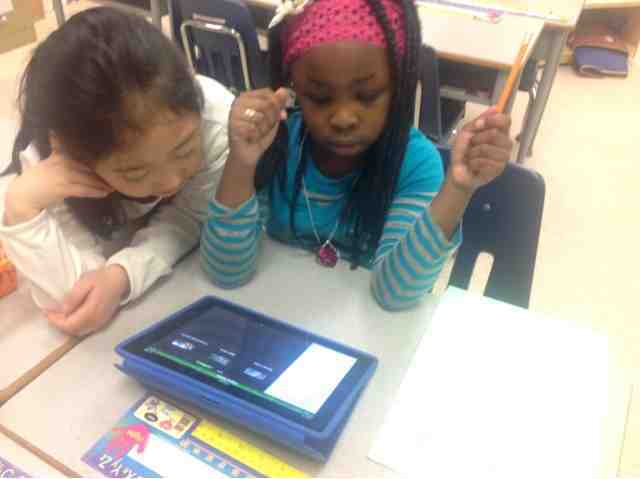 One group used Explain Everything to add the screen shots of their books and record their voice. Most created their "movies" in iMovie. Some recorded their images in Draw and Tell first, while others recorded directly in iMovie. Some didn't record at all and added music instead. I never told them how they had to present it to the world but I did expect them to come up with a way to be able to show the world their creations. I think what impressed me most about this project was that my students did so much of this independently. I was away from my class a fair bit over the past few weeks and while I have fantastic teachers on call that work with my students while I am away, my students really didn't need them either. They were in control of their learning. Searched for images in Discovery Ed to add to their books. Created images in Draw and Tell to add to their books. Sent the finished book to iBooks and took screen shots of each page. Saved their final movies into the iPad Camera Roll and shared those movies on their individual blogs. What would I change for next time? Discourage the use of music in their book videos. Ensure that all students send their books to iBooks before they take their screen shots for the voice recordings. If using iMovie do the voice recordings in Draw and Tell to eliminate the Ken Burns affect. It really bothers me when their hard work isn't seen because of the Ken Burns affect. 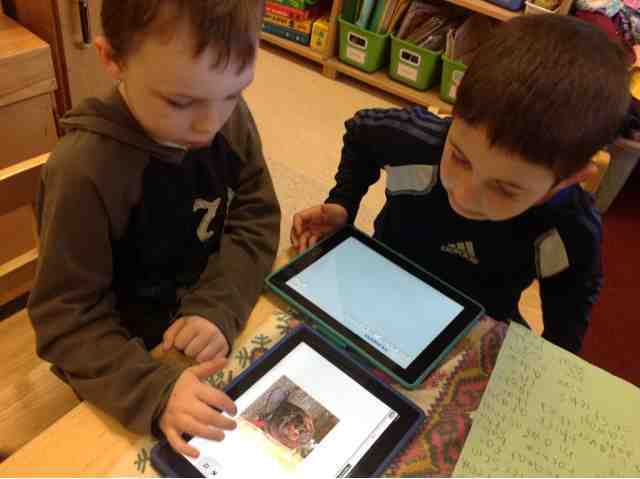 Expect them to add a credit to Discovery Ed, Pocket Zoo App, and the books that they used for their research. Encourage each student to reflect more on the experience. Many did anyhow. I can't wait to share these with my own kids and my students. Nice job describing your workflow. I could envision our whole building finding parts of this process to apply to student learning. Fantastic. I learn because others share with me, so I'm glad you'll share this with others. Great Post Karen, I would love to do some sharing between our classes. I will have to think about how that would look like. Maybe some a feedback piece. It's amazing what our little ones can do! A suggestion.... if you upload them to youtube then embed them into your blog, would you be able to see more of the book? It's a shame that you can't see your little peoples' entire books on your blogpost. wow - what a fantastic project! Thanks for sharing. I am starting an information text unit for next 6 wks and want my class (1st grade too) to write and record their books. I am worried about the use of one 1pad in the classroom - any suggestions most welcomed. With just one iPad you may want to group the students up and provide each group with a tide to create their pages. The may want to create non digital images, and pre write their sentences so when they get their turn on the iPad it can just be a quick typing in of information (and of course deciding on page colour/font etc) and then taking photos of their draw images then uploading those. Send those books to iBooks, and then take screenshot and send those to Explain everything, or educreations, iMovie. The trick with just one iPad is that you'll need to do the thinking away from the iPad so that it is best utilized. The key is to have the iPad used by a variety of people over the span of your project. Prior to about a year ago I too only had one iPad in my classroom, and I may be there again at the completion of this year. Only time will tell. Good luck. Thanks for being so specific about the process you and your students took in this project. I hope to incorporate some of your ideas into my animal research unit next year. If Grade 1s can do it, Grade 2s definitely can. 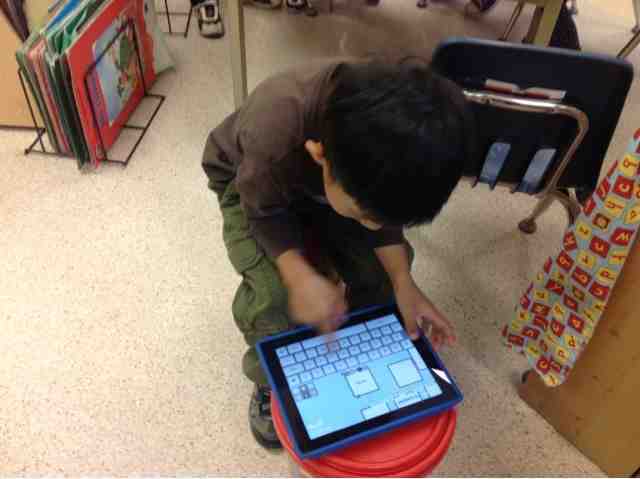 Of course, my students and I will have a lot to learn about using the technology first!